At first glance, it's a simple shift dress. But look closer – the curved princess seams, wide neck and trusty ottoman fabric combine to create a super-flattering style. Add in the three-quarter-length sleeves and handy hidden pockets and you'll never want to take it off. …details make your day infinitely happier. To liven up your office outfit, we've added a striped grosgrain trim detail on this pencil dress. The cinched-in waist and dart seams flatter, while the ottoman fabric smoothes and shapes your figure. See, didn't we tell you it had the happy factor? This shift dress has got a trick up its sleeve – ruffles. The subtly flared flutter detail adds a contemporary touch to this sleek, elegant style. Made from stretchy Ponte fabric for a comfortable fit, it's simple but oh SO effective. When you should have left five minutes ago, reach for this feminine fit-and-flare dress. 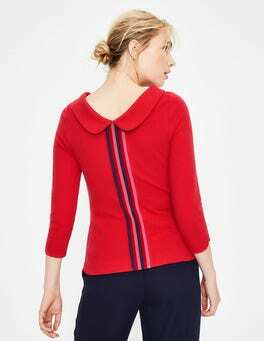 The boat neck and seam detailing add a contemporary touch to the elegant shape. Go for a sleek solid colour or an eye-catching all-over floral print. Everyday elegance? We've got the dress for that. This fit-and-flare midi is crafted from textured ottoman fabric that's got enough stretch to keep you comfortable, while the three-quarter-length sleeves make it the ultimate transitional piece. Destined to be your next wardrobe hero, this cap-sleeved swing dress has a whimsical floral print that's perfect for those don't-know-what-to-wear weekends. The ponte fabric's two-way stretch skims your shape, while the full lining keeps you comfortable. The classic style you’ll want on hand – day or night, Monday to Friday. Our pencil is somehow both perfectly fitted and incredibly comfortable. This is all down to the textured cotton ottoman with added stretch – a fabric that refuses to lose its shape.